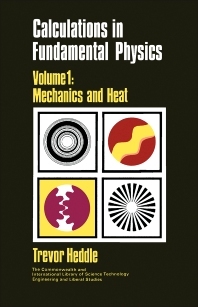 Calculations in Fundamental Physics, Volume I: Mechanics and Heat focuses on the mechanisms of heat. The manuscript first discusses motion, including parabolic, angular, and rectilinear motions, relative velocity, acceleration of gravity, and non-uniform acceleration. The book then discusses combinations of forces, such as polygons and resolution, friction, center of gravity, shearing force, and bending moment. The text looks at force and acceleration, energy and power, and machines. Considerations include momentum, horizontal or vertical motion, work and energy, pulley systems, gears and chains, and rotation and power. Elasticity, expansion and temperature, and static fluids are also discussed. The manuscript examines ideal gases, quantity of heat, centripetal acceleration, and rotary inertia. Topics include change of density, constant temperature, specific and latent heat, and gravitation and circular orbits. The text also explains simple harmonic motion, transfer of heat, molecular theory of gases and vapors, thermodynamics, and fluid flow. The book is a valuable source of information for readers interested in the mechanisms of heat.